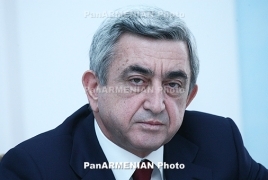 PanARMENIAN.Net - Former Armenian president and prime minister Serzh Sargsyan has not discussed the possibility of implementing a state of emergency in the wake of a civil disobedience campaign in April, head of Sargsyan’s office Nairi Petrosyan said. Sargsyan was forced to resign just one week after taking office as the country's new Prime Minister amid massive protests which demanded his resignation. Protest leader Nikol Pashinyan was ultimately elected the country's 16th PM. Reuters reported earlier that Sargsyan, Armenia’s ruler for a decade, was in touch with Russian officials as he fought for survival, according to a diplomatic source who spoke on condition of anonymity. In the intervening 24 hours, Sargsyan reportedly had intensive discussions with his own allies and officials. They discussed the possibility of implementing a state of emergency, which would give security agencies greater powers to use force against the protesters. “We had two options: parliament could introduce a state of emergency in the country or Serzh Sargsyan could resign,” said Eduard Sharmazanov, a lawmaker with the ruling Republican Party and deputy speaker of parliament. Petrosyan said in response to the article that Sargsyan has not discussed a possible state of emergency with any foreign leader. Azerbaijan's drills "a response to Armenia's resolve not to cede land"
Azerbaijan is holding major military drills on March 11-15 but has not notified the OSCE of such plans. Armenian Prime Minister Pashinyan said the contacts between Armenia and Azerbaijan have been informal. The two discussed allied relations between the two countries as well as issues related to bilateral ties. "Armenia and the U.S. have long worked together to address the current humanitarian catastrophe in Syria," Naghdalyan said.